Have you ever wondered if you have what it takes to be an SUP contender? Every Thursday evening from now through August 29th, you'll be able to test your prowess and hone your skills at the Sunset SUP Series. 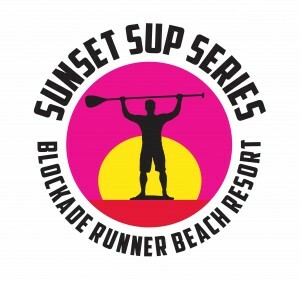 The SUP races begin at the Blockade Runner sound side dock each Thursday at 6 pm. The address for the beach resort hotel is 275 Waynick Blvd. Simply arrive early enough to register and unload your gear. The event is free! Remember that PFDs and leashes are required by the U.S. Coast Guard. There will be two races for both the Men's and Women's Intermediate and Elite Divisions. The courses will start from the Blockade Runner and change weekly. Courses will be set up based on the conditions and announced by 4 pm each Thursday. After a fun and challenging race, participants can enjoy post-race refreshments provided by Natty Greene's Brewing Company. It typically takes 30 to 45 minutes to complete the course. Please note that participants will be responsible for securing their own parking space, along Waynick Blvd.